The Gypsy Rose slot from BetSoft is right up there with the best. The game is all about a fortune telling gypsy maiden. This theme works well with the choice of art-style, as well as the gameplay features. All this combines to create a title with great replay value. Great theme. The artwork, animation, and features all complement each other. We’re left with a game with a memorable look and feel. Strong game features. There are loads of different game modes that can be activated. These allow players to enjoy Gypsy Rose on repeat visits. Low upper betting limit. Even BetSoft’s strongest titles, like Gypsy Rose, don’t cater for the highest rollers around. “Wild” = 1000x the line bet. Love potion = 300x the line bet. Gypsy woman = 240x the line bet. Magic book = 180x the line bet. Crow = 150x the line bet. The game lists a top payout of 336,000 credits available through bonus features. When the Crystal Ball symbol occurs on an active pay line and two matching Magic Symbols (Love Potion, Magic Book, Gypsy, or Crow) are adjacent to it on reels two and four, a special feature will occur. There are four unique features, one for each Magical Symbol. We’ve detailed them all below. 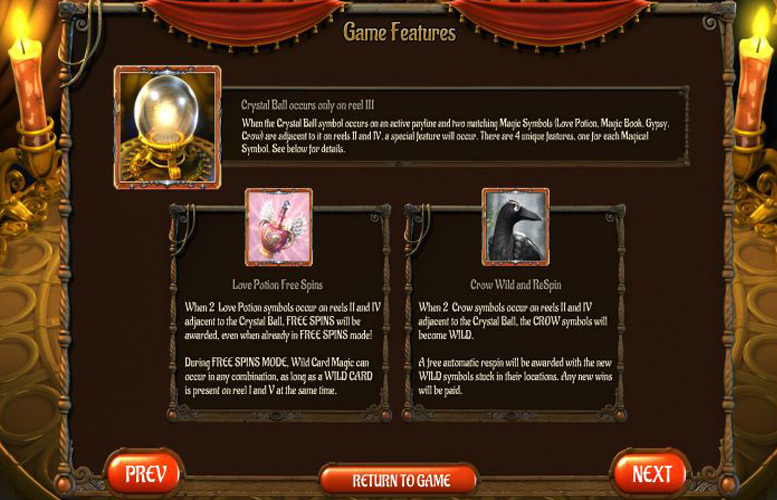 When two Love Potion symbols occur on reels two and four, adjacent to the Crystal Ball, free spins will be awarded. This can occur when already playing the mode too. 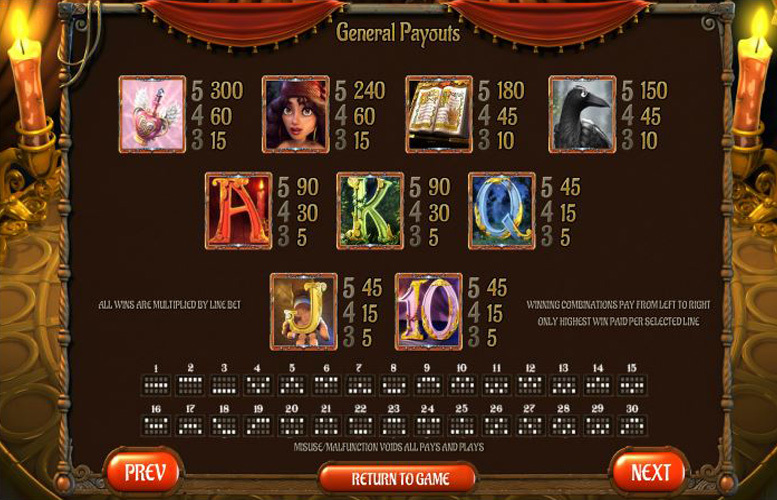 During the free spins feature, “Wild Card Magic” can occur in any combination, if a “Wild Card” is present on reels one and five at the same time. More on this shortly. When two Crow symbols occur on reels two and four adjacent to the Crystal Ball, the Crow symbols will become “wild”. A free automatic re-spin will be awarded with the new “wild” symbols stuck in their locations. Any new wins will then be paid. When two Magic Book symbols occur adjacent to the Crystal Ball, an instant credit win will be awarded. Players will earn up to 20x their total bet in this instant bonus win. When two Gypsy symbols occur on reels two and four, adjacent to the Cryptal Ball, the Tarot Card bonus will begin. Players must click on seven different cards and earn a credit score based on the matching colours and characters they’ve revealed. Of the fifteen to choose from, there are five different figure cards, in three unique colours. The bonus won will be calculated based on the cards they reveal. Two wizards = 4x the game bet. Three wizards = 8x the game bet. Two maids = 5x the game bet. Three maids = 10x the game bet. Two kings = 3x the game bet. Three kings = 6x the game bet. Two queens = 1x the game bet. Three queens = 2x the game bet. Two jesters = 2x the game bet. Three jesters = 4x the game bet. 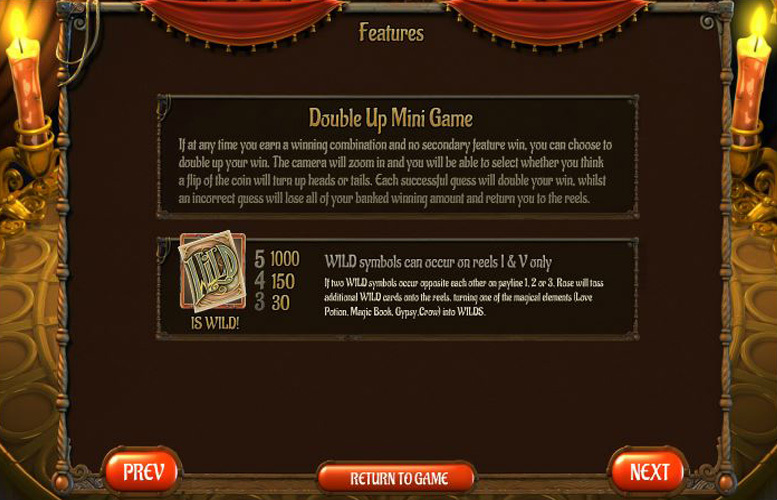 Following any winning combination with no secondary feature, players can choose to “double up”. The camera will zoom in and they’ll be able to select whether they think a flip of the coin will turn up heads of tails. Each successful guess will double players’ winnings. Meanwhile, an incorrect guess will lose all the banked amount and return the action to the reels. The game’s “wild” symbol can occur on reels one and five only. If two of these land opposite each other, on pay line one, two, or three, Rose will toss additional “wild” cards onto the reels. This turns one of the magical elements (Love Potion, Magic Book, Gypsy, or Crow) into “wilds”. Ace, or King = 90x the line bet. Queen, Jack, or Ten = 45x the line bet. Gypsy Rose allows players a lot of discretion over how they spread their bets across the reels. They can choose between one and 30 win lines, and between one and five coins per line. In addition, players are also given the option to adjust the value of every coin. Here, the minimum is 2p, and the maximum is 50p. This means that with the all values set to the minimum, the lowest bet per spin is just 2p. Meanwhile, with everything maxed out, the largest is an underwhelming £75. Whilst most players are unlikely to find this low upper betting limit too restrictive, there will certainly be some high rollers that do. 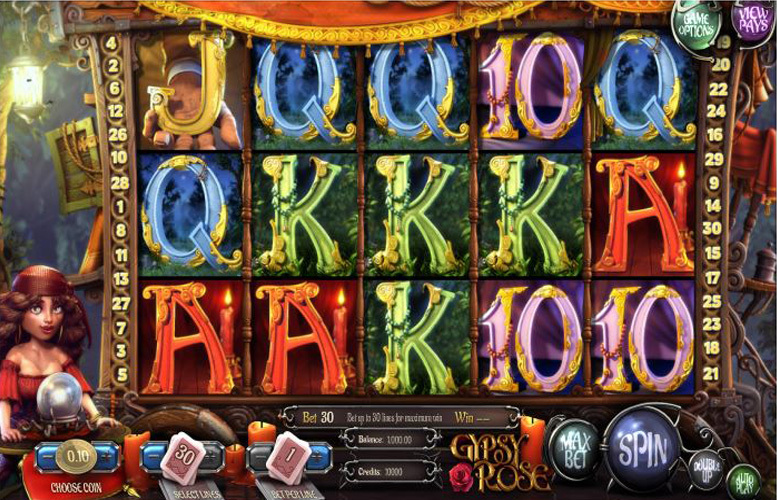 Gypsy Rose is a great slot machine from a company who are making a name for themselves for just that. The title has many strong features. From its amazingly high return-to-player rating, and its strong theme, right through to its diverse offering of bonus features, this one will likely excite most players. This game has a rating of 5 / 5 with 733 total reviews by the users.